Situated on 25 acres of century old trees and lush flower gardens, the House MacLeod Bed and Breakfast is private and secluded. It is an original Upper Peninsula log homestead, circa early mid-1800’s, that has been completely restored. 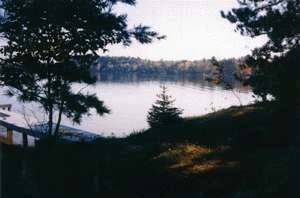 Guests can hike, bike, walk, cross-country ski, hunt and snowmobile the nearby trails; tour historic Seul Choix Point Light House, swim in pristine Gulliver Lake; and fish in a choice of three inland lakes within a 3 mile drive. Many guests just like to take a leisurely walk to nearby Lake Michigan. Truly a tourist’s and sportsman’s paradise. Guests also utilize nearby McDonald lake for swimming, boating and fishing activities (1/4 mile drive or walk). Their is a gambling casino and a seasonal authentic drive-in movie theater within 7 miles. Guests also enjoy private beach for sunsets and swimming.